Experiencing any sort of chest pain can be worrisome, and this is especially true of chest pain that comes and goes. You may think it was just a passing discomfort that has been resolved, but the pain returns and reignites your worry that something could be seriously wrong. What causes chest pain that comes and goes, and how is it different than heart pain? Continue reading to learn the answers to these questions and to discover some tips for preventing this intermittent chest pain. GERD: or gastroesophageal reflux disease, can cause a sharp and tender pain in the chest that may feel similar to a heart attack, despite the pain being classified as a non-cardiac chest pain. GERD occurs when the stomach acid or contents flow back into the food pipe and irritate the esophagus, resulting in a burning sensation or chest pain. Stable angina: This is the most prevalent form of angina and commonly occurs during periods of physical exertion, such as working out or climbing stairs. The pain may only last for a few minutes and often dissipates with rest. Unstable angina: Unstable angina pain can occur even when you are not active, and may last for up to 30 minutes. This pain can be indicative of a heart attack and should be addressed by a medical professional immediately. Angina pain has been described as a squeezing pressure or severe pain in the center of the chest. Costochondritis: Inflammation of the cartilage—where the ribs meet the sternum—can cause chest pain around the breastbone that is often a result of a viral infection. Pleuritis: This is the inflammation of the lining of the lungs and can feel like pain or pressure in the chest that worsens when you try to take a deep breath. As previously stated, not all chest pain is related to the heart, so how can you tell the difference? While most heart and chest pain occur in the area behind the breastbone, cardiac pain may also radiate down your arms, back, shoulders, and neck. Chest pain related to the heart is also described differently. While those experiencing GERD describe their pain as sharp, cardiac related chest pains are said to feel deep, heavy, squashing, and tight. Cardiac pain may also cause other symptoms such as dizziness, sweating, nausea, shortness of breath, numbness in the left arm or shoulder, and lightheadedness. In contrast, chest pain associated with acid reflux or GERD may cause difficulty swallowing, frequent belching, burning in your throat, chest, or stomach, and a sour taste in your mouth. The following chart may help you determine what kind of chest pain you are experiencing. If you feel your chest pain may be in any way related to the heart, it is important to seek the advice of your doctor. How It Feels Deep pain that feels like pressure, tightness, squeezing, or burning. May also be felt in arms, jaw, back, and throat. Sharp pain easier to pinpoint, feels closer to the surface rather than deep. What Causes It Pain usually occurs after periods of exertion, specifically those that require upper arm movement like carrying a heavy briefcase of shoveling snow. Exertion in extreme heat or cold and followed by a heavy meal is a common cause. Happens randomly, seemingly out of nowhere. In the case of heartburn, most often occurs after a meal, especially one containing fried foods. How Long It Lasts Lasts as long as the exertion period does and is reduced quickly once exertion is finished. Can come and go very quickly and last between a few seconds and a few hours. Pain Relief Cessation of the activity causing the pain. Sitting down and leaning into the discomfort may provide some relief, while laying down can worsen the pain. Seek medical attention as your condition requires treatment. Exercise may help, as well as breathing exercises and over the counter medications like ibuprofen and acetaminophen. Heat compresses and antacids may also relieve pain. Chest pain may also be caused by issues with the structures in the chest. Muscle tenderness may be causing the pain you are experiencing, as well as common heartburn. You could also be experiencing a pulmonary embolism, which happens when a blood clot blocks an artery in the lung and can cause shortness of breath, sharp chest pains, and a cough that brings up pink mucus. Some common ways to prevent experiencing chest pain are quitting smoking, managing your blood pressure and cholesterol, and staying in shape with regular exercise and eating a healthy, low-fat diet. 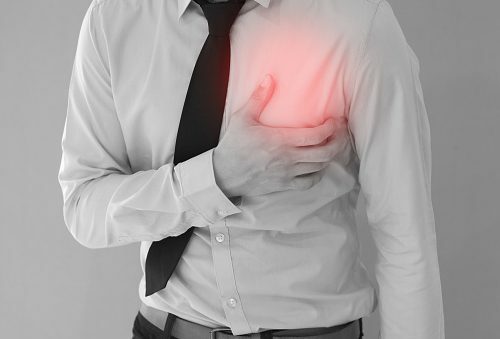 Experiencing chest pains that come and go may be frightening, and it is important to determine whether the pain is being caused by your heart and is therefore a serious concern, or something else that is more minor. If you are concerned about any chest pain, see your doctor and follow their recommendations to prevent the pain from recurring.